Even top hotels on swanky St. Barts is catching on to the "more for your $$" trend luxury travelers are loving these days. Kudos to Hotel Le Toiny, the fabulous 15-villa resort overlooking the Caribbean Sea, for coming up with its own version of the "Stimulus Package." Now through April 15, all guests at Le Toiny, whether booked at room-only rates or enjoying the Romance, Spa or Island Breeze packages, will enjoy a $400 per couple, per day hotel credit valid towards meals, drinks or spa treatments. We highly recommend spending some of your hotel-given dollars on dinner at Le Gaiac and pampering treatments at the peace-inducing Serenity Spa Cottage. EliteTravelGal also recommends booking Le Toiny's three-, five- or seven-night Island Breeze package, offered through December, which includes: accommodations in a one-bedroom oceanview villa with private pool, daily breakfast, round-trip airport transfers, a three-course dinner, use of a rental car, and a one-hour spa treatment of choice. 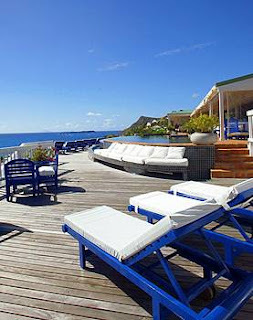 Contact us at elitetravelgal@aol.com for more details on this and other sensational savings opportunities in 2009 at Hotel Le Toiny on St. Barts.